The oversold condition in stocks that has developed over the last several weeks is more than trivial. I highlighted on Christmas Eve the baker’s dozen reasons why equity markets could tactically rally from that point, showing extremes in a variety of indicators. Extremes of the nature witnessed are typically indicative of good entry points, and they don’t just look pretty in charts, they have statistical merit too. 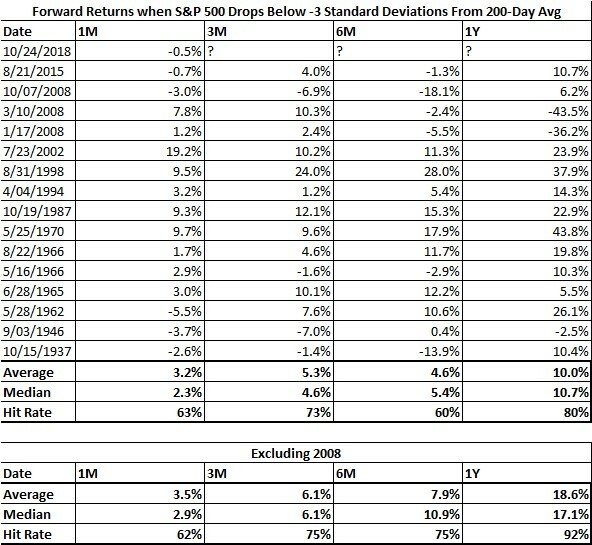 Here I’ll cover just a few of those extremes, showing the infrequency with which they have historically developed and the forward returns that they are associated with. Let’s start with the market’s deviation from trend. Here we define trend as the S&P 500’s distance from its own 200-day moving average, and we define a significant deviation from that trend if the market is more than 3 standard deviations below it. We only count a deviation from trend once it drops below 3 standard deviations below the moving average for the first time in a month, so as to not double count. Since 1934 there have been 16 such instances. 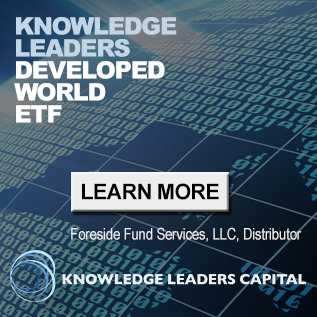 Median forward returns a year later are 10% with a hit rate of 80%. But, the numbers are significantly skewed by the 2008 meltdown. 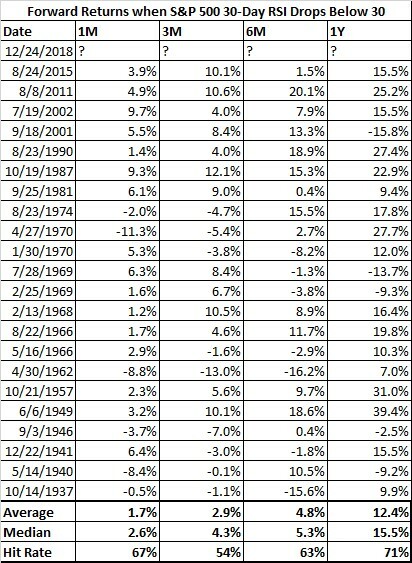 If we exclude that period, forward 1 year returns are 17% with a hit rate of 92%. New lows in individual stocks have also hit significant extremes recently. 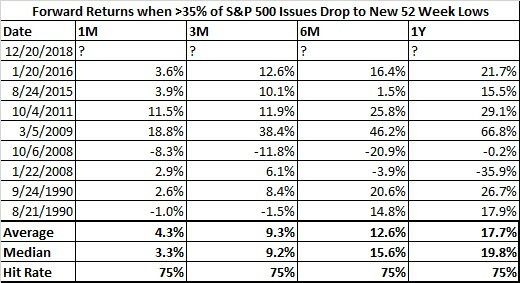 Here we show all the instances since 1990 (as far back as our data goes) in which more than 35% of S&P 500 issues hit a new 52 week low. Again, to avoid double counting, we only count instances where the indicator rises above 35% for the first time in a month. Forward 1 year returns are 20% on median with a 75% hit rate. The only year ahead losses were when the indicator triggered in 2008. Lastly, we have recently witnessed extremes in the relative strength index (RSI), another measure of the market’s deviation from trend. The S&P 500 30-day RSI dropped below 30 on Christmas Eve, which is a significant reading. Generally, excellent returns were produced the other 22 times since 1934 when the RSI dropped below 30 for the first time in a month. The median year ahead return was 15.5% with a 71% hit rate. Such abnormal forward returns with relatively high hit rates should be paid attention to, especially when a variety of indicators are telling us the same thing. Now, extremes in these indicators do not preclude the market from making new lows or testing the lows. 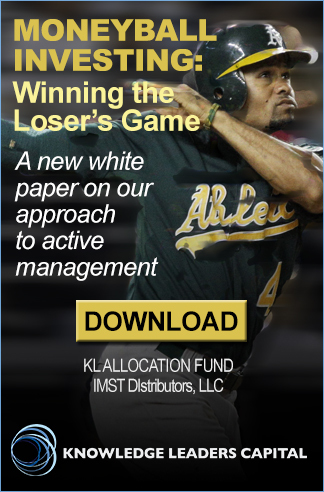 In fact, interim 1, 3, and 6 month returns can vary widely. But for long-term investors, these extremes do tend to coincide with excellent entry points into equities, on average.